You can search, in any website’s search function, using firefox’s address bar. Now, at first glance this sounds really boring and useless, but it really isn’t, at all. Then, right click on the search box, and click “Add a keyword for this search”. This brings up the standard bookmark – your search keywords are stored as a bookmark. Give it a useful name, something to help you next time you go sorting through your book marks. Now, the keyword is how we use this trick. I’m going to use “bugs”, but you can use anything you want, just remember, this is the word you put before your search string in the address bar. Click Add. Now, all we have to do, is to search for a bug. Let’s use the classic bug 1. Open a new tab (CTRL + T), then in the address bar type [your keyword] microsoft market share, and hit enter. 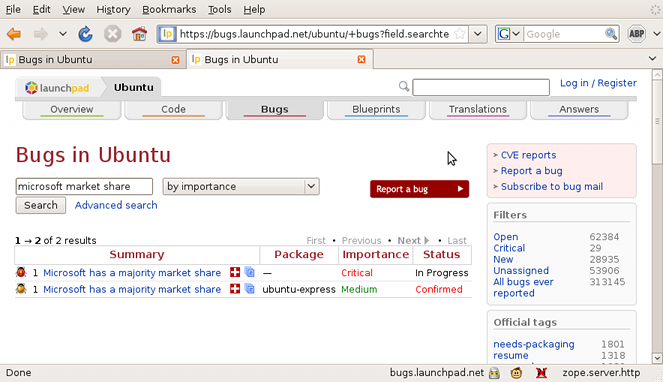 This entry was posted in Remember This, Ubuntu and tagged Linux, sysadmin, tools, Ubuntu on September 16, 2009 by Kirrus.